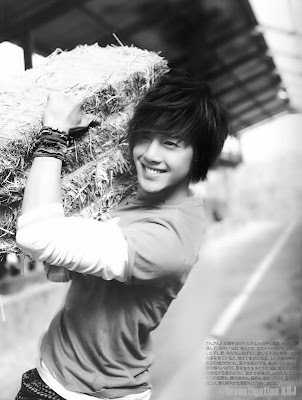 I'm worried about Kim Hyun Joong's health again. 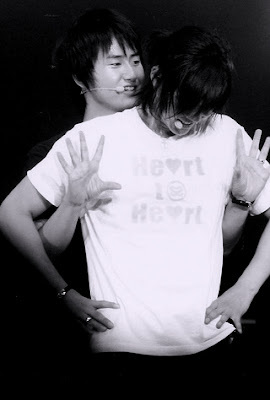 He almost fainted in Malaysia, Young Saeng came to the rescue and supported him from behind. I guess the exhausting everyday practice for concerts, endless interviews, travels and other schedules have drained his energy. He's so well known in S. Korea that everybody wants a piece of him. He's not the only one who is so tired, the rest of the SS501 members are also looking thin these days. Since I've begun reading a lot about the Korean Entertainment Industry, it seems a lot of artists are overworked and often fall ill due to exhaustion. Doesn't that reflect how their management are handling their schedules ? Do they have enough consideration for their stars' welfare? Hmm, if the star is well established enough, wouldn't it be prudent to consider quality over quantity? In Japan for BOF promotonal events, Leader is suffering from cold, sore throat and fever. He took medicine and rested in the hotel. It was previously stated he would not be attending the second event on the 6th / yesterday, but I read he did. Oh, here's hoping he will get better soon. And also for Young Saeng, Kyu Jong, Hyung Joon and Jung Min...I hope all of SS501 will be given time off by DSP to get a much needed rest break before their next performance, and that Hyun Joong won't be too stubborn....but to relent and rest. Hope to see him looking strong, healthy,a bit chubbier and smiling like in the pix above.